Ha kusan, Japan, April 7, 2016 – EIZO Corporation (TSE: 6737) today announced the release of RadiLight, a new easily attachable comfort light that is compatible with EIZO’s RadiForce lineup of medical monitors up to 32 inches. In order to prevent reflections on the monitor screen caused by ambient light, reading rooms where radiologists carefully examine medical images are often kept dark. However, viewing a bright monitor in a dark environment over a long period of time can cause eyestrain and make it more difficult to see documents or other tools in the workstation. 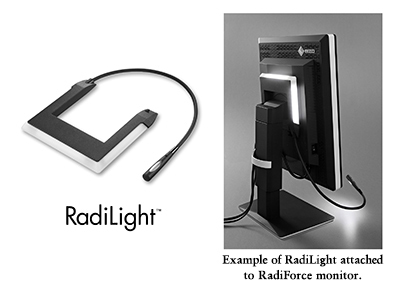 The RadiLight comfort light accessory attaches to the back of RadiForce monitors to shine a light directly on the wall behind it. This eases the amount of concentrated light traveling to the radiologist’s eyes for reducing eyestrain while not impacting the visibility of the images on the screen. The brightness of RadiLight’s wall light feature, called RadiLight Area, can be adjusted to ten different levels of brightness. This allows radiologists to choose the most appropriate and comfortable lighting for their environment. In addition to RadiLight Area, the accessory is equipped with a spotlight called RadiLight Focus which allows the viewer to check or read printed documents or see the keyboard and other tools more easily. 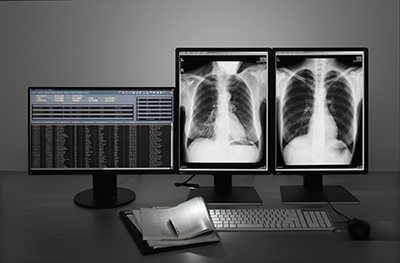 Both RadiLight Area and RadiLight Focus can be easily turned on or off with the touch of a button so radiologists can use it only when needed. RadiLight will begin shipping in April. Date of availability varies by country so contact the EIZO group company or distributor in your country for details. All product names are trademarks or registered trademarks of their respective companies. RadiLight is a trademark, and EIZO and RadiForce are registered trademarks of EIZO Corporation.